Mid-tier broadcasters are apparently more effective than big ones. Some people lose the desire to play the games they watch on Twitch. But according to research conducted by one of the company's science team members, those who feel the opposite are plenty enough to boost sales and retention rates. The study, authored by Danny Hernandez, says Hearthstone's success after it exploded on Twitch "raised the line of inquiry" he was only able to explore recently after getting the data he needed. Hernandez listed a few examples to illustrate his point, including Tom Clancy's The Division. He believes the website was responsible for around 18 percent of its sales. Hernandez determined that Steam-connected viewers are more likely to buy a game within 24 hours of watching a stream. In addition, the study found that current players of, say, games like DOTA are five percent more likely to show up in their second week of playing if they watched streams during their first week. "[M]oving retention even a single percent is crazy hard," Hernandez wrote, so five percent is big news. The paper lists a couple of advice for developers, as well. It says the best way to take advantage of Twitch is to build your community before launch and to think of novel ways to engage your audience. Indie sporting management sim Punch Club, for instance, garnered 1.2 million views from the developers' pre-launch Let's Play stream on the Twitch plays Punch Club channel. Its creators only released the game after the people in chat finished the whole thing. As a result, 2.8 percent of Steam-connected viewers snatched the title. The study also says that engaging mid-tier influencers -- or those who average 33 to 3,333 viewers every broadcast -- is the best way to reach buyers. 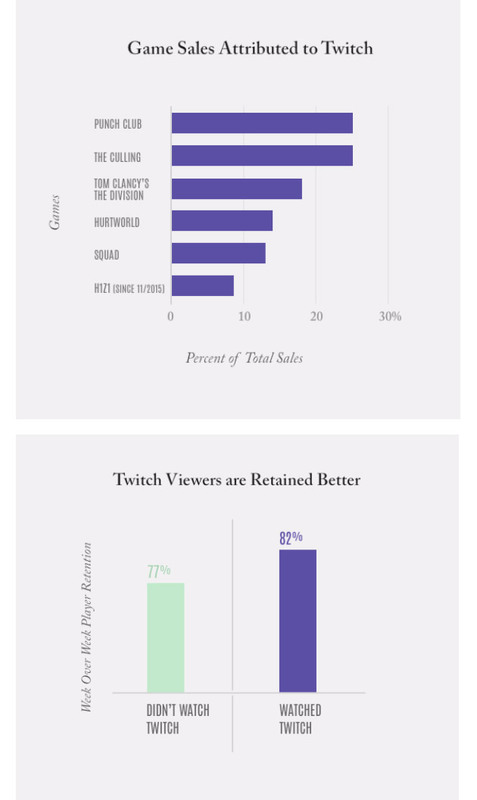 They're 13 times more effective than big streamers, and Hernandez credits them with 46 percent of Twitch-related sales. We're sure some of you would prefer reading a study by a non-biased, third party researcher instead, but this paper will still give you a glimpse of Twitch's internal data. Read it here.